This introductory chapter provides a comprehensive overview of the concept of change in organizations. The chapter defines change as a process with emphasis on a systems perspective. It explains that to really know what change is and to develop the competencies for effective change management, one must understand the factors that are the core components of any organizational change: paradox, content, process, and context. 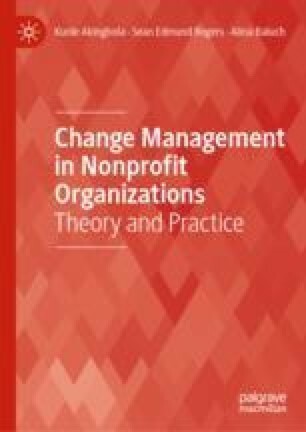 The chapter examines the types of change and the drivers of change to explain why change is an imperative, how change evolves and manifests in organizations. Accept360. Why Technology Is Important for Organizational Change, February 20, 2018. http://www.accept360.com/technology-important-organizational-change/. Retrieved July 20, 2018. Ashburner, L. (1990). Impact of Technological and Organisational Change. Personnel Review, 19(2), 16–20. https://doi.org/10.1108/00483489010143285. Beycioglu, K., & Kondakci, Y. (2014). Principal Leadership and Organizational Change in Schools: A Cross-Cultural Perspective. Journal of Organizational Change Management, 27(3). https://doi.org/10.1108/JOCM-06-2014-0111. Brown, R., & Wilson, J. O. S. (2018, January 26). Brexit’s Impact on Small Businesses: The Experts May Be Spot on After All. The Conversation. https://theconversation.com/brexits-impact-on-small-businesses-the-experts-may-be-spot-on-after-all-90561. Retrieved July 14, 2018.
Cooper, M., & Pogrebin, R. (2018). Turmoil at Lincoln Center: Infighting, Money Troubles, Scrapped Projects. New York Times. https://www.nytimes.com/2018/07/01/arts/lincoln-center-troubles.html. Retrieved July 8, 2018. Denning, S. (2011, July 23). How Do You Change An Organizational Culture? Forbes. https://www.forbes.com/sites/stevedenning/2011/07/23/how-do-you-change-an-organizational-culture/#6e5a087d39dc. Retrieved July 8, 2018. DesJardine, M. (2014, July–August). Leading Employees Through Major Organizational Change. Ivey Business Journal. https://iveybusinessjournal.com/publication/leading-employees-through-major-organizational-change/. Finkelstein, S. (2016). Why These Three Questions Can Solve Any Problem. BBC. http://www.bbc.com/capital/story/20160406whythesethreequestionscansolveanyproblem. Retrieved April 7, 2016. Gongloff, M. (2018, July 13). Trump Doesn’t Understand His Own Trade War. Bloomberg. https://www.bloomberg.com/view/articles/2018-07-13/trump-s-trade-war-is-a-bunch-of-misunderstandings. Retrieved July 13, 2018. Hilson, G. (2017). CIBC Leads Canadian Banks in Online Functionality. IT World Canada. https://www.itworldcanada.com/article/cibc-leads-canadian-banks-in-online-functionality/396373. Retrieved February 13, 2018. Johnson, E. (2017, June 13). How to Communicate Clearly During Organizational Change. Harvard Business Review. https://hbr.org/2017/06/how-to-communicate-clearly-during-organizational-change. Retrieved June 13, 2018. Kessler, E. H., & Charles, M. (2007). Strategic Implications of Nanotechnology. Business Strategy Series, 8(6), 401–408. https://doi.org/10.1108/17515630710684619. Kovacs, M. (2017). CIBC Unveils Voice Commands in Mobile App to Simplify Navigation. IT World Canada. https://www.itworldcanada.com/article/cibc-unveils-voice-commands-in-mobile-app-to-simplify-navigation/392237. Retrieved February 13, 2018. New York Times. (2017). How ‘Brexit’ Could Change Business in Britain. https://www.nytimes.com/interactive/2016/business/international/brexit-uk-what-happens-business.html. Retrieved July 14, 2018. Satell, G. (2013, June 8). How Technology Is Changing the Way Organizations Learn. Forbes. https://www.forbes.com/sites/gregsatell/2013/06/08/how-technology-is-changing-the-way-organizations-learn/#5f04462e5e14. Retrieved February 13, 2018. Siegel, R. (2018, May 29). Here’s What to Expect from Today’s Starbucks Racial Bias Training. Washington Post. https://www.washingtonpost.com/news/business/wp/2018/05/23/not-who-we-aspire-to-be-starbucks-previews-next-weeks-racial-bias-training-for-8000-employees/?noredirect=on&utm_term=.a6a51dfa5ee9. Starbucks Newsroom. (2018, May 23). A Preview of the May 29 Curriculum for 175,000 Starbucks Partners Across the Country. https://news.starbucks.com/news/starbucks-curriculum-preview-for-may-29. Stewart, E. (2018, June 25). Harley-Davidson Is a Loser in Trump’s Trade War: Harley-Davidson Is Shifting Production of Its European-Bound Motorcycles Overseas Because of Tariffs. Vox. https://www.vox.com/2018/6/25/17501436/harley-davidson-europe-tariffs-trade-war. Retrieved February 13, 2018. Valenti, J. (2018, April 12).‘Our Bodies, Ourselves’? It’s Shelved. New York Times. https://www.nytimes.com/2018/04/12/style/our-bodies-ourselves-book-publishing.html. Williams, R. (2015, April 6). Get Ready for the Coming Leadership Storm: As Baby Boomers Retire, Gen Y Are Reluctant to Fill Their Shoes. Financial Post. https://business.financialpost.com/executive/leadership/get-ready-for-the-coming-leadership-storm-as-baby-boomers-retire-gen-y-are-reluctant-to-fill-their-shoes. Retrieved July 13, 2018.